The Assyrian Empire was built on the strength of their powerful army. The warrior society of the Assyrians produced fearsome soldiers as well as innovative generals. They used chariots, iron weapons, and siege equipment to dominate their enemies. The early Assyrians were a warrior society. Every young man was expected to train as a warrior and be ready to fight. As the Assyrian Empire grew, they built a standing army. A standing army is one made up of professional soldiers whose only job is to fight. The Assyrian soldiers were trained in siege warfare, battle tactics, and hand-to-hand combat. Every spring the Assyrian army would launch a battle campaign. They would conquer rich cities, expanding the Assyrian Empire and bringing back wealth to the king. It is estimated that the size of the Assyrian army at its peak was several hundred thousand soldiers. The kings of the Assyrians used this fearsome army to build and expand their empire. The fear of the army was used to keep the newly conquered people in line. They built forts and roads throughout the empire to help the army to travel quickly to troubled spots. Any rebellion was quickly crushed. Eventually, the Assyrian Empire became too big to manage in this way. The cruelty of the Assyrian soldiers caused rebellion throughout the empire spreading the army thin. When the Babylonians united with the Medes in 612 BC, they overthrew the Assyrians and brought an end to their reign. The kings of the Assyrians were expected to be warriors themselves. They led the Assyrian army into battle and fought fiercely. Of course, they were surrounded by an elite force of troops whose job was to keep the king alive. Even so, some kings did die in combat, such as Sargon II. One of the greatest strengths of the Assyrian army was its chariots. A chariot is a wheeled vehicle pulled by two to four horses. Riders would stand on the chariot. Typically there were two riders; a driver and a soldier armed with a spear and a bow and arrow. Sometimes a third man was added to protect the rear. Chariots were used to smash into enemy lines to create a gap for the rest of the army. They were also used for leaders and generals who could move about the battlefield quickly issuing orders. The Assyrians used a wide variety of weapons including swords, spears, bows and arrows, slings, and daggers. The Assyrians were the first to use iron to make their weapons. Iron was stronger than the bronze used by their enemies and gave them a distinct advantage. 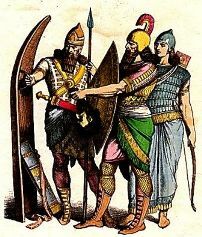 The main armor used by Assyrian soldiers was a shield and helmet. Archers had a shield bearer who would cover them while they got off shots. Full body armor was generally reserved for the officers and generals. The Assyrians invented some of the first siege equipment to defeat fortified cities. They used battering rams to break down gates and siege towers to go over walls. This was the first time that such complicated siege equipment was used in battle. The Assyrians were experts in the area of logistics. They built food stores along the roads of their empire to feed their army as it traveled. The king's court generally accompanied him while on a war campaign. This included his family, servants, advisors, and even entertainment. The Assyrian army was one of the first to use cavalry. They used inflated sheep skins to keep rafts afloat while they transported heavy chariots across rivers. They had something similar to the Pony Express to carry messages throughout the empire quickly.